عابدی, مریم, افشار, احمد, ابراهیم زاده اردستانی, وحید, نوروزی, غلامحسین. (769). مدل‌سازی دوبُعدی داده‌های گرانی‌ با استفاده از روش معکوس‌سازی فشرده و معیار توقف تغییر چگالی. 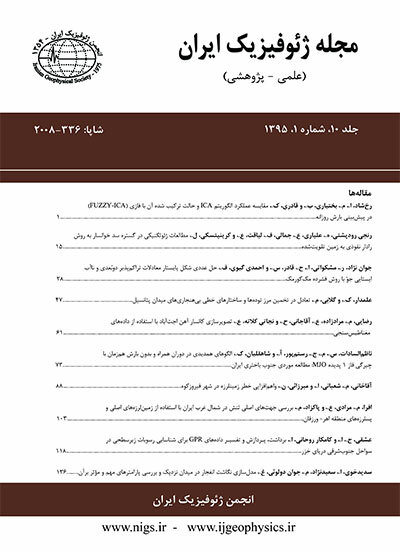 مجله ژئوفیزیک ایران, 5(1), 92-108. مریم عابدی; احمد افشار; وحید ابراهیم زاده اردستانی; غلامحسین نوروزی. "مدل‌سازی دوبُعدی داده‌های گرانی‌ با استفاده از روش معکوس‌سازی فشرده و معیار توقف تغییر چگالی". مجله ژئوفیزیک ایران, 5, 1, 769, 92-108. عابدی, مریم, افشار, احمد, ابراهیم زاده اردستانی, وحید, نوروزی, غلامحسین. (769). 'مدل‌سازی دوبُعدی داده‌های گرانی‌ با استفاده از روش معکوس‌سازی فشرده و معیار توقف تغییر چگالی', مجله ژئوفیزیک ایران, 5(1), pp. 92-108. عابدی, مریم, افشار, احمد, ابراهیم زاده اردستانی, وحید, نوروزی, غلامحسین. مدل‌سازی دوبُعدی داده‌های گرانی‌ با استفاده از روش معکوس‌سازی فشرده و معیار توقف تغییر چگالی. مجله ژئوفیزیک ایران, 769; 5(1): 92-108. اکثر روش‌های مدل‌سازی دارای محدودیت‌اند و این محدودیت برای مدل‌سازی داده‌های پتانسیل نیز وجود دارد. به دلیل پیچیدگی روش‌های مدل‌سازی نهشته‌های با شکل نامشخص، معمولاً سعی می‌شود که این ساختارهای زیرزمینی با شکل‌های ساده شده‌ای شبیه‌سازی شوند. با استفاده از این شبیه‌سازی صورت گرفته، می‌توان پارامترهایی مثل عمق و محدوده نهشته‌ها را برآورد کرد. اما نکته این است که شکل واقعی نهشته می‌تواند کاملاً، متفاوت از شکل ساده شبیه‌سازی شده باشد. بنابراین برای رفع این محدودیت، سطح زیر زمین را با استفاده از منشورهای دوبُعدی چهارگوش تقسیم‌بندی و روش‌های مدل‌سازی را پیاده می‌کنند. در این مقاله با فرض ساختار نامشخص هندسی برای نهشته‌، از روش اصلاح شده مدل‌سازی معکوس فشرده برای داده‌های گرانی‌سنجی استفاده شده است. این روش حجم نهشته ایجاد کننده بی‌هنجاری را حداقل می‌کند که این امر معادل بیشینه کردن فشردگی نهشته است. در اینجا برای به دست آوردن تعداد تکرار مناسب برای همگرایی مدل، از معیار توقف جدید تغییر چگالی استفاده شده است. این روش روی داده‌های مصنوعی بدون نوفه و نوفه‌دار آزمایش شد؛ سپس روی داده‌های واقعی یعنی زغال‌های بیتومینه دهلران به کار رفت. نتیجه نهایی حاکی از لایه‌ای از زغال با عمق بالایی 10 متر است که تا عمق 35 متر گسترش دارد. نتایج حفاری نشان از لایه‌ای از زغال با عمق بالایی حدود 7 تا 10 متر است. Potential field data (gravity and magnetic data) are usually analyzed by means of linear transformations, spectral methods, inversion techniques and analytic signal methods. Nowadays, there are diverse methods of modeling the gravity data, but each has some limitations. One of the limitations of these methods is the assumption of a simple shape for buried structures, whereas the actual shape could be entirely different. The present study uses two-dimensional 4-sided polygons (prisms) to resolve these limitations, because with these it is possible to make any shape for an unknown underground structure by arranging these prisms. Within the context of this study, the 2D inversion method proposed by Last and Kubik (1983) is reused. For this purpose, a Matlab-based 2D inversion code was developed. This code uses an iterative least squares procedure, which allows the weights to depend on the densities of the previous iteration. Therefore, the solution minimizes both the area of the underground structures or deposits and the weighted sum of squared residuals. According to Last and Kubik, the iterative procedure stops when a minimum area of the density distribution is reached. The stopping criteria in inversion algorithms are usually based on the fit between the observed data and theoretical data produced by the proposed model. Typically, a misfit function estimator is used. In the inversion of potential field data, the number of observations is often less than the number of unknowns (underdetermined problem). To overcome this problem, this study uses a new method proposed by Ekinci, wherein the density variation is used as a new stopping criterion to find the required number of iterations for convergence the model. The focusing inversion method proposed by Last and Kubik was modified in order to produce a compact final model. For this model, the difference between the block densities at the last successive iteration is minimal. This method minimizes the volume of deposit, which is equivalent to maximizing its compactness. Here, the method for noise-free and noise-corruption synthetic data was used and after obtaining satisfactory results it was applied to real data. The Dehloran Bitumen map in Iran is chosen as a real data application. The area under consideration is located in the Zagros tectonic zone, in western Iran, where a search for Bitumen is under way. Layers of medium bedded limestone with intermediate marl-limestone are the dominant formations in the area, and the hydrocarbon zone is one of the most important characteristics of the area. By using the method for noise-free and noise-corruption synthetic data, the present study produced a program for the Dehloran Bitumen map. Anomaly modeling was used because the anomaly value of the cross section, which is taken from the gravity anomaly map of Dehloran Bitumen, is very close to those obtained from this method. The final result of these methods shows that the deposit starts from the depth of 10 meters to about 35 meters. This modeling was a satisfactory representation of the results of actual drilling in the region. The results of the drillings show that the lowest depth of the deposit varies from 7 to 10 meters. This 2D modeling of gravity data with the compact inversion method and density variation can easily be applied for gravity, microgravity and magnetic data.